"Kardak" redirects here. For the village in Iran, see Kardak, Iran. 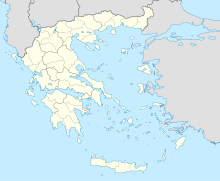 Imia (Greek: Ίμια) or Kardak is a pair of small uninhabited islets in the Aegean Sea, situated between the Greek island chain of the Dodecanese and the southwestern mainland coast of Turkey. Imia/Kardak was the object of a military crisis and subsequent dispute over sovereignty between Greece and Turkey in 1996. The Imia/Kardak dispute is part of the larger Aegean dispute, which also comprises disputes over the continental shelf, the territorial waters, the air space, the Flight Information Regions (FIR) and the demilitarization of the Aegean islands. In the aftermath of the Imia/Kardak crisis, the dispute was also widened, as Turkey began to lay parallel claims to a larger number of other islets in the Aegean. These islands, some of them inhabited, are regarded as indisputably Greek by Greece but as grey zones of undetermined sovereignty by Turkey. The European Union backed the Greek side on the Imia dispute, and warned EU-candidate country Turkey to refrain from any kind of threat or action directed against the sovereignty of EU member state Greece. Turkey was called upon to solve any border disputes with its neighbors through peaceful ways, in accordance with the United Nations Charter, and or by raising the matter at the International Court of Justice instead. The islets lie 5.5 nautical miles (10.2 km; 6.3 mi) east of the Greek island Kalymnos, 1.9 nmi (3.5 km; 2.2 mi) southeast of the Greek island of Kalolimnos, 3.8 nmi (7.0 km; 4.4 mi) west of the Turkish peninsula of Bodrum, and 2.2 nmi (4.1 km; 2.5 mi) from the Turkish islet of Çavuş Adası. The islets lie some 300 m apart from each other, eastern one being slightly larger than the western. Their total surface area is 10 acres (4.0 ha). 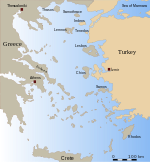 The islands are also referred to as Limnia (Λίμνια) in Greek, or İkizce in Turkish, or as Heipethes in some early-20th century maps. While several other aspects of sovereignty rights in the Aegean, such as the territorial waters and national airspace, had been disputed between the two countries for decades, conflicts over the possession of island territory were unknown until the end of 1995. The Turkish hydrographic maps recognize until 1985 the course of the Greek-Turkish border halfway between Imia and the Turkish coast. The dispute over Imia arose when, on 26 December 1995, the Turkish cargo ship Figen Akat accidentally ran aground on one the East islet and had to be salvaged. A Greek tugboat responded to the distress call. The Turkish captain initially refused the assistance offered, maintaining that he was within Turkish territorial waters. He ultimately accepted being towed to the Turkish port of Güllük by the Greek tugboat. The Greek captain filled in the necessary papers for the salvage fee but the Turkish captain objected, arguing that the freighter had been in Turkish waters. On 27 December, the Turkish Foreign Ministry notified the Greek authorities that it believed there was a sovereignty issue, and on 29 December it declared the islets Turkish territory. On January 9, Athens rejected the claim, citing the Treaty of Lausanne (1923), the Convention between Italy and Turkey (1932) and the Treaty of Paris (1947). The whole event was barely reported in the media so it was not widely known to public until a month later, on 20 January 1996 when the Greek magazine GRAMMA ran a story, one day after Kostas Simitis was appointed to form a new Greek government as prime minister. The article brought a severe reaction from the Greek press, which was followed by four citizens of the neighboring island of Kalymnos, including the mayor and the owner of a herd of sheep that remained on the islets, hoisting a Greek flag on the East islet on 25 January. To oppose this, on 27 January some Turkish journalists from Hurriyet landed on the islet with a helicopter, lowered the Greek flag and hoisted a Turkish flag, the whole event being broadcast live on Turkish television. On 28 January, the Greek Navy lowered the Turkish flag and restored the Greek, resulting in an exchange of fierce statements by the Turkish prime minister Tansu Çiller and the new Greek prime minister Kostas Simitis. Turkish and Greek naval forces were alerted and warships of both countries, both NATO members, sailed to the islets. During the crisis, at the night of 28 January, Greek special forces landed secretly on the east islet undetected. On the 30th of January, Turkish and Greek officials gave statements, each insisting on their sovereign rights on Imia/Kardak. Also, Turkish armored units moved to the Green Line on Cyprus, which caused the alert of the Cypriot National Guard. On 31 January at 1:40 am Turkish special forces SAT Commandos also landed undetected on the west islet escalating the tensions. It was not until 4 hours later when the Greeks noticed this when a Greek helicopter took off at 5:30 am from the Greek frigate Navarino for reconnaissance. During the mission it crashed over the islets (some speculating due to Turkish fire), but this was concealed by both states to prevent further escalation, although three Greek officers on the helicopter were killed: Christodoulos Karathanasis, Panagiotis Vlahakos, and Ektoras Gialopsos. The immediate military threat was defused primarily by American officials—in particular, US envoy Richard Holbrooke, working by telephone with officials of both sides during the final hours of the crisis. The Greeks and Turks did not speak directly to one another, but were responsive to Washington's assistance as an informal intermediary. Agreement was given by both sides to the United States to return to the "status quo ante"—i.e., differing views on sovereignty and no military forces on the islets. Greek and Turkish officials provided assurances to the United States that their military forces on and arrayed around the islets would be removed, with the U.S. agreeing to monitor the withdrawal. While US engagement was instrumental in defusing the crisis, the fundamental territorial issue has remained unresolved since that time. In January 2016, Greek Defence Minister, Panos Kammenos, flew over eastern Aegean Sea in a military helicopter and threw a wreath into the sea around the islets where the three Greek Navy officers were killed in 1996. Tensions around the islets were renewed in January 2017, in light of deterioration of Greco–Turkish relations following Greek refusal to extradite participants of the failed 2016 Turkish coup d'état attempt to Turkey. A Turkish navy missile boat accompanied with two special-forces speedboats entered the area around the islets on 29 January 2017. According to the statement issued by the Defence Ministry of Greece, they were blocked and warned by Greek coast guard vessels and withdrew from the area after about seven minutes. The Turkish armed forces denied that the ships were blocked but did not otherwise deny the incident; they stated that the mission was a part of an inspection of the Aksaz Naval Base by chief of General Staff Hulusi Akar, who was on board at the time. In February 2018, Greek authorities said that a Turkish coast guard patrol vessel rammed a Greek coast guard boat near the islets. Nobody was injured, but the Greek vessel suffered damage to the stern where the Turkish boat rammed it with its bow. Greece complained to Turkey about the incident. Turkey’s Foreign Ministry denied the Turkish vessel was at fault. It said the Greek statement misled Greece’s own public and distorted the truth “as always”. The next day a footage revealed showing the Turkish patrol boat ramming the Greek boat. Also, Turkey has started to build a watchtower, a facility to accommodate soldiers and a pier on the nearby islet of Çavuş Adası. Thermal cameras will be installed on the island to enable the Turkish Coast Guard to monitor naval activities around the islets. The crucial point of reference for the assessment of the legal status of the islets, acknowledged as such by both sides, is the Peace Treaty of Lausanne of 1923. With this peace treaty, Turkey confirmed large cessions of former Ottoman territory to Greece and Italy which had been de facto under their control since 1911 or 1913. The chain of the Dodecanese islands, which includes the islands neighbouring Imia/Kardak, were ceded to Italy. Later the rights to these islands were ceded by Italy to Greece with the 1947 Treaty of Paris. However, the Treaty of Lausanne does not mention every single small island by name, but treats them summarily. Accordingly, at the heart of the legal issue of Imia/Kardak is the question whether these islands, by virtue of their geographic situation, fall under the scope of the renunciation of sovereignty and the cession to Italy as defined by certain articles of the Treaty of Lausanne. There are also issues relating to the interpretation of a later protocol signed between Italy and Turkey in 1932; regarding certain diplomatic exchanges made between the three parties at various times between 1932 and 1996; and regarding the relevance of actual practice (the factual exercise of sovereignty by either party) prior to 1996. "[...] Except where a provision to the contrary is contained in the present Treaty, the islands situated at less than three miles from the Asiatic coast remain under Turkish sovereignty." "Turkey renounces in favour of Italy all rights and title over the following islands: [here follows an enumeration of the 13 largest islands in the Dodecannese area, by name], and the islets dependent thereon [...]"
"Turkey hereby renounces all rights and title whatsoever over or respecting the territories situated outside the frontiers laid down in the present Treaty and the islands other than those over which her sovereignty is recognised by the said Treaty, the future of these territories and islands being settled or to be settled by the parties concerned. [...]"
The problem is because Imia/Kardak is situated just outside the three-mile boundary of Article 12, but is also not in an obvious, strict sense geographically "dependent" (Article 15) on the larger Dodecanese islands (being still closer to the Turkish mainland than to the next larger island). Greece considers that the wording of Articles 12 and 16 together precludes any Turkish claim to territories outside the three-mile boundary once and for all, and that the criterion of "dependency" must be understood in a rather wide sense as covering everything in the whole general area of the Dodecanese outside the three-mile limit, in order to give the provisions of the treaty an inherently consistent meaning. Turkey, on the other hand, claims that the criterion of "dependency" must be understood in a narrow sense, and that formations such as Imia/Kardak may therefore constitute "grey zones" that the treaty has left undecided; or indeed that Turkish sovereignty over them still holds. Source: Text of the 1932 treaty and border protocol, and modern maps of the area. After the Treaty of Lausanne, a dispute arose between Turkey and Italy over some other small islands, not directly related to the area of Imia/Kardak. This dispute was settled through a compromise, which was sealed in a bilateral treaty in 1932 at Ankara. As an appendix to that treaty, the two governments formally assured each other that they now considered the whole remaining Dodecanese border between them to be uncontroversial, and appointed a bilateral technical committee to trace its exact delimitation cartographically. The committee produced a technical protocol that was signed by envoys of the two foreign ministries in the same year. This protocol mentions Imia explicitly, as being on the Italian (i.e. later Greek) side. The protocol itself, according to the present-day Turkish argument, does not bear the formal characteristics of an international treaty. The Greek side now holds that it nevertheless constitutes compelling evidence that the Turkish government of the time had made a binding commitment to accepting the delimitation as described in the protocol. The Turkish side holds that the protocol is not binding as an international treaty and therefore has no value whatsoever for the resolution of the present dispute. Italy ceded Dodecanese islands to Greece with the 1947 Treaty of Paris. Article 14 enumerates the islands to be transferred to Greek sovereignty, and states that adjacent islets are to be transferred. Turkish and Greek sides dispute the meaning of the term. Turkey claims that Imia/Kardak does not fit into the definition stipulated by the Article 14 of the treaty. After the 1996 crisis, the Turkish and Greek governments have made various claims that certain diplomatic exchanges between Turkey and Italy after 1932, and between Turkey and Greece after 1947, provided proof that the respective opponents at that time held legal opinions different from what they claim today, making their present stance inconsistent and untenable. Thus, Turkey has claimed that both the Italian government during the 1930s and the Greek government between 1947 and the 1950s had shown itself to be well aware that the 1932 protocol did not provide legal grounds for an exact delimitation of the boundary. Conversely, Greece claims that Turkey, already during the 1930s, had explicitly confirmed to Italy that it considered the 1932 protocol valid and binding. However, most of this evidence is contained in diplomatic exchanges that have never been disclosed to the public by either of the two parties. Greece also cites as evidence for a former Turkish acceptance of Greek sovereignty the diplomatic procedures around the original delimitation of Flight Information Regions (FIR) within the framework of the ICAO, in 1950. The relevant treaty states that, in the Aegean zone, the boundary between the Athens and Istanbul FIRs was to follow the boundaries of the territorial waters. This implies, according to the Greek view, that both parties at that time were taking for granted that a mutually agreed border did indeed exist, which would contradict the claims of persisting "grey zones" made today by Turkey. The maps of the air zones published after that agreement (e.g. an official map published by Turkey in 1953) do indeed show a line that runs where Greece today claims the territorial boundary should be, with Imia/Kardak on the Greek side. Turkey holds that the agreement about the FIR boundaries was not concerned with determining sovereignty, and thus has no bearing on the issue. During and after the crisis of 1996, both sides put a lot of emphasis on previously published maps, which were cited as evidence purportedly showing that their respective views were shared by third parties, or had even been shared by the opposite side. For instance, a national road map sponsored by the Turkish Ministry of Defense, published just before the crisis, shows Imia (Limnia) as Greek territory. There are other Turkish maps of before 1996 that show Imia/Kardak as Greek. However, the cartographic evidence of before 1996 is so mixed that the only safe conclusion one can draw from it is that neither of the two governments ever bothered to enforce a consistent representation of whatever legal opinions they held with respect to these islands, in the work of their cartographic state agencies. There is also the case of a neighbouring islet, only a few miles from Imia/Kardak, called Zouka, Dzouka or Topan Adası, which was consistently shown as Turkish in Greek naval maps, but as Greek in Greek topographic maps. When the attention of the Greek government was drawn to this fact in 2004, it was quick to admit that Zouka was in fact Turkish and that the attribution to Greece had been a mere technical mistake, since Zouka in fact lies on the Turkish side of the demarcation line of the 1932 protocol. Some of the existing cartographic problems can probably be traced back to a 1946–47 British cartographic survey conducted by the crew of HMS Childers. According to the account of its former navigation officer it is possible that the islets in question were wrongfully charted as belonging to Turkey by his predecessor. The reason was that during the Second World War boats of a British Special Boat Service flotilla often evaded German patrols by making fast alongside Turkish fishing boats near the islet and convincing the Germans that they were Turkish fishermen in Turkish territory. Out of this experience one officer of HMS Childers, who had served the special boat flotilla, probably charted the Turkish name of these islets, Kardak, and attributed them to Turkey. It is well possible that when the whole Dodecanese was ceded to Greece in 1947, these islets may not have been included in official maps because of the wartime experience of a British naval officer. It appears, in short, that contradictory cartographic evidence in this field has been caused either by wartime mistakes, mere inattention or inadvertent proliferation of previous technical mistakes. It does not necessarily reflect consistent legal opinions or policies of either side. The conflicting cartographic evidence may nevertheless be one of the causes for the different sovereignty claims. Bill Clinton said about the crisis: "I thought my aides were joking when they said Turkey and Greece would engage in war over rocks on which none but sheep live. I held phone calls with the leaders of both countries, and convinced them to not go to war over the rocks that inhabited mostly 20 sheep". After 1996, most foreign countries have carefully avoided taking an unequivocal stand on the Imia/Kardak issue in favour of either side. However, both Greek and Turkish public opinion has been eager to observe the stance of foreign governments on the issue, as evidenced through details such as the cartographic treatment of Imia/Kardak in maps published by state agencies. Particular close attention has been paid in this context to maps published by US government agencies. Shortly after the 1996 crisis, the US National Imaging and Mapping Agency (NIMA) removed the Greek name Vrakhoi Imia from its maps, adding instead a note saying "Sovereignty undetermined", but in a new edition a few months later, in October 1996, it reverted that move and returned to the Greek name. In addition, the U.S. administration suggested that Turkey’s claims be taken to a peaceful resolution according to the international law. The government of Italy, the original contracting party of the 1932 border protocol, stated on 6 February 1996 that it considered the protocol valid, thus lending support to the Greek position. The European Union backed the Greek side on the Imia Islets dispute, and warned Turkey to refrain from any military operations against Greek sovereignty, and, along with the European Parliament, called Turkey to solve any disputes it has with Greece through the International Court of Justice. The resolution by the European Parliament entitled "Resolution on the provocative actions and contestation of sovereign rights by Turkey against a Member State of the Union" also stated that Greece's borders were EU borders. In addition, it stated that the islets of Imia/Kardak belongs to Dodecanese group of islands pursuant to the 1923, 1932 and 1947 treaties and whereas even on Turkish maps from the 1960s, these islets are shown as Greek territory. After the incident Greece threatened to reopen debate on implementation of an EU customs union accord with Turkey and to block an EU aid package that is part of the accord. Greece mentioned that Turkey broke a commitment under the accord to have amicable ties with EU members. Many EU foreign ministers urged the parties to solve differences amicably. EU members were concerned that Greece’s moves against Turkey would violate the customs union accord and interfere with developing ties and access to Turkey’s market. The United States were also concerned since they were a proponent of Turkish-European links. The French President Jacques Chirac “indicated that the fewer new problems Greece created for EU-Turkish cooperation, the more likely France would be to show solidarity with Greece.” Other European governments reportedly implied that if Greece sabotaged the customs union, then they would stall talks on Cyprus EU membership. Greek Prime Minister said that Greece would cooperate with the EU once Turkey agreed to International Court of Justice jurisdiction, but Turkey must initiate an appeal to the International Court of Justice since it is questioning Greek rights. The Greek opposition criticized the government, for its inability to get more support from Europe, while Turkey sent officials to Europe to explain their views and to counter Greece’s attempt to impede Turkish-EU relations and recalled its ambassador from Athens. ^ Arapoglou, Stergios, Major. "Dispute in the Aegean Sea". Maxwell Air Force Base, Alabama. Retrieved 2013-07-24. ^ a b Migdalovitz, Carol. "Greece and Turkey: The Rocky Islet Crisis" (PDF). Congressional Research Service - The Library of Congress. Retrieved 2013-07-24. ^ Commission: Turkey must respect EU member states’ sovereignty europa.eu, 20 December 2016 (accessed 3 January 2017). ^ "Turkey 2015 Report" (PDF). ec.europa.eu. 2015-11-10. Retrieved 2017-01-03. ^ Commission: Turkey must respect EU member states’ sovereignty euractiv.com, 2 December 2016 (accessed 3 January 2017). ^ Turkey’s Accession to the European Union: An Unusual Candidacy - Google Books Books.google.gr, 28 December 2008 (accessed 03 January 2017). ^ After Turkish provocations, EC calls on Ankara to respect member states ekathimerini.com, 2 December 2016 (accessed 3 January 2017). ^ "United States of America Congressional Record Proceedings and Debates of the ... - Google Books". Books.google.gr. 1995-12-25. Retrieved 2017-01-03. ^ "Europarliament Support Greek Positions On Aegean". Kastellorizo.org. 1995-03-06. Retrieved 2017-01-03. ^ a b c d Yüksel İnan, Sertaç Başeren (1997): Status of Kardak Rocks. Kardak Kayalıklarının statüsü. Ankara. (ISBN 975-96281-0-4). ^ a b c "DISPUTE IN THE AEGEAN SEA THE IMIA/KARDAK CRISIS" (PDF). AIR COMMAND AND STAFF COLLEGE AIR UNIVERSITY. 2002. pp. 29, 42–43. ^ Hadjidimos, Katharina (1999). "The Role of the Media in Greek - Turkish Relations" (PDF). Archived from the original (PDF) on 24 September 2015. Retrieved 26 August 2015. ^ Greece, Turkey pull back warships, CNN.com, 31 January 1996. ^ "Wreath laying by Defence Minister Panos Kammenos into the sea around Imia islets". Greek Ministry of National Defence. 28 January 2016. Retrieved 4 April 2017. ^ "Imia are 'Turkish soil' says Turkish FM, prompting Greek reaction". 1 December 2016. Retrieved 1 December 2016. ^ "After Turkish provocations, EC calls on Ankara to respect member state". 2 December 2016. Retrieved 2 December 2016. ^ "Greek and Turkish warships in standoff in Aegean sea". Guardian. 30 January 2017. Retrieved 30 January 2017. ^ "Turkish navy ship approaches Greek island of Imia". 29 January 2017. Retrieved 30 January 2017. ^ "Greece protests to Turkey over boat incident, Ankara denies fault". 13 February 2018. Retrieved 13 February 2018. ^ "Video evidence shows Hellenic Coast Guard ship narrowly avoided being sunk". 16 February 2018. Retrieved 16 February 2018. ^ "Video emerges of Turkish boat ramming Greek coast guard". 17 February 2018. Retrieved 17 February 2018. ^ "Turkey starts building watchtower on island of Çavuş near controversial Kardak islets". 15 February 2018. Retrieved 15 February 2018. ^ "World War I Document Archive". Lib.byu.edu. Retrieved 2015-08-25. ^ "Hellenic MFA". Hri.org. Retrieved 2015-08-25. ^ a b c "The question of the Imia islands. Turkish allegations on "Grey zones" in the Aegean Sea". Hellenic Ministry of Foreign Affairs. Archived from the original on 2004-10-28. Retrieved 2015-08-25. ^ "Background Note on Aegean Disputes / Rep. of Turkey Ministry of Foreign Affairs". Mfa.gov.tr. Retrieved 2015-08-25. ^ "ATMG - Aegean Issue". Archived from the original on 16 May 2009. Retrieved 26 August 2015. ^ a b c d "Imia Rocks Maps". Hri.org. Retrieved 2015-08-25. ^ a b c "Various Maps of the Imia islets". Hri.org. Retrieved 2015-08-25. ^ Turkiye, 1:500 000. Map 2. Turkiye resmi Karayollari Haritasi - Official Road Map of Turkey. A joint production of the Turkish Ministry of Defence (M.S.B. Harita Genel Komutanlig-Turkey) in Ankara, and the Kartographischer Verlag [etc]. Published by Kartographischer Verlag R.Ryborsch, Frankfurt am Main. ^ "Athens News Agency: News in Greek, 02-11-04". Hri.org. 2002-11-04. Retrieved 2015-08-25. ^ Cooper, W. (2 July 2003). "Letters to the editor - Throwing light on the Imia/Kardak issue". Athens News SA. Archived from the original on 15 December 2007. Retrieved 26 August 2015. ^ TURKISH MEDIA REACTION TUESDAY, NOVEMBER 3, 2009 "Conservative Star quotes Clinton on the 1996 Kardak (Imia) crisis between Greece and Turkey. "I thought my aides were joking when they said Turkey and Greece would engage in war over rocks on which none but sheep live. I held phone calls with the leaders of both countries, and convinced them to not go to war over the rocks that inhabited mostly 20 sheep," said Clinton, who had also observed the success of Greece-Turkey earthquake diplomacy." ^ "Gov't satisfied with Pentagon statement referring to Imia as Greek territory". Embassy of Greece. 21 June 1997. Archived from the original on 14 March 2012. Retrieved 26 August 2015. ^ "A tale of two islets: The Imia incident between Greece and Turkey". hri.org. Retrieved 2017-02-01. ^ "Greece and the Law of the Sea, p145". Martinus Nijhoff Publishers. Retrieved 2017-02-27. ^ Tsakonas, Panayotis J. (2008). "How can the European Union transform the Greek-Turkish conflict?". In Arvanitopoulos, Constantine. Turkey’s Accession to the European Union: An Unusual Candidacy. Springer Science & Business Media. p. 111. ^ Rumelili, Bahar (2004). The microprocesses of hegemonic influence: The case of EU and Greece/Turkey (PDF). Bogazic University. p. 12. ^ "[Resolution, February 15, 1996]". European Parliament. 15 February 1996. Retrieved 2016-10-26 – via hri.org. Sezgin, I.Can (2009): Why they did not fight? A Study on the Imia/ Kardak Crisis (1995-1996) between Greece and Turkey through web archive. Yüksel İnan, Sertaç Başeren (1997): Status of Kardak Rocks. Kardak Kayalıklarının statüsü. Ankara. (ISBN 975-96281-0-4). Ali Kurumahmut, Sertaç Başeren (2004): The twilight zones in the Aegean: (Un)forgotten Turkish islands. Ege'de gri bölgeler: Unutul(may)an Türk adaları. Ankara: Türk Tarih Kurumu. (ISBN 975-16-1740-5). Ali Kurumahmut (1998): "Ege'de temel sorun: Egemenliği tartışmalı adalar." Ankara: Türk Tarih Kurumu. (ISBN 975-16-0954-2). Dimitrios Lucas (2005): "Greece's Shifting Position on Turkish Accession to the EU Before and After Helsinki 1999." MA thesis, Catholic University of Leuven. Ethesis.net. Kallivretakis, Leonidas (1996). Report on the "Limnia-Imia" islets (PDF). Athens: National Hellenic Research Foundation. This page was last edited on 4 July 2018, at 13:39 (UTC).